Still not totally recovered from my episode of overwork, though I have managed to get a few more seeds in the ground since then. Planted radishes and arugula in the bed with the spinach and replanted the first two rows of greens that did not sprout. Seeing a few carrots coming up now which is good and the miniature bok choy is doing well. Already having to water the raised beds as rain has been scarce, but some predicted tomorrow which I hope will show up so that the new seeds will sprout. 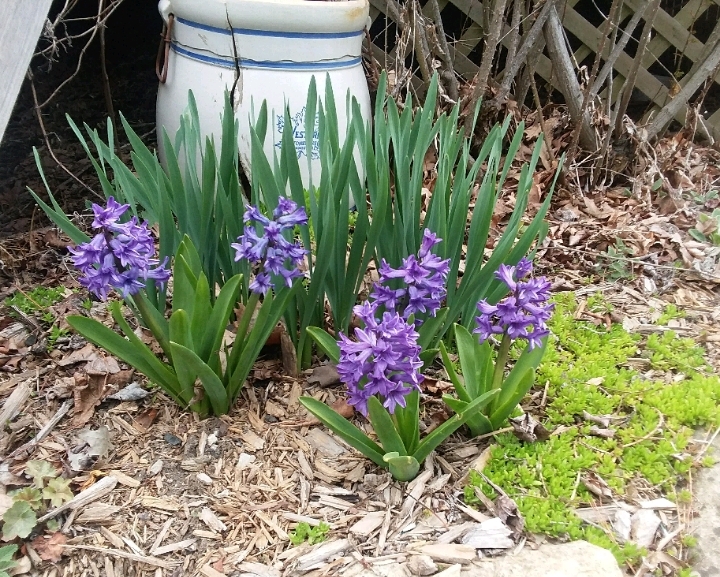 The hyacinth bloomed well and the cool weather has kept them beautiful for longer than usual. Trying to set myself just one small task outside each day so that I won't get totally behind. Picked up a number of limbs that had fallen over the winter, small limbs, maybe I should say big sticks. Trimmed the lirope. Problems arise when I get outside because I forget I'm suppose to be trying to recover and I see a weed or more likely the wild honeysuckle that tries to take over everything and oops I've pulled it without thinking. 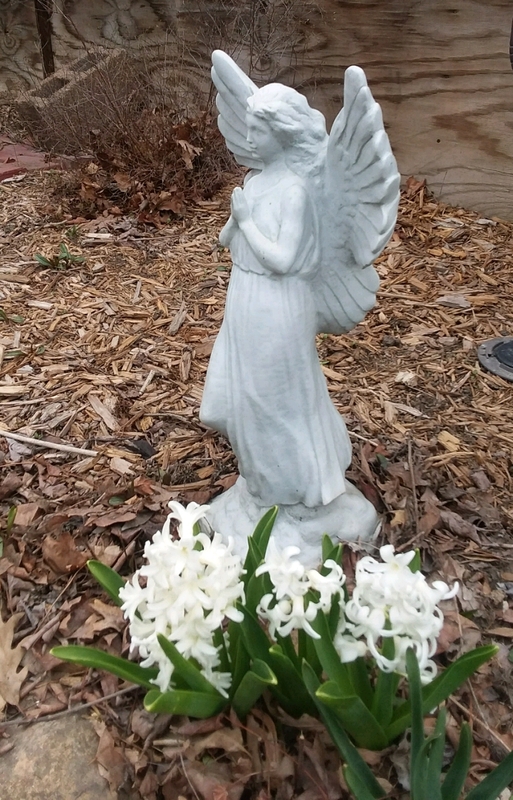 I should take a hint from Spring which is so slow in coming and slow down. Anah now has a boyfriend, well sort of. They are "talking" which I think is a precursor to other things. I got a great chuckle from her statement to her mom. When talking about this new situation, Anah said, "Look Mom, I'm Nefertiti and Beyonce all rolled into one, and I'm not about to hang out with anyone who is not worthy of me." At least she knows her own value, something I have always been short on. Two more sports injuries in the family. Jade was sidelined from softball with a strained ligament in her foot and now Anah has a hip flexor strain which has taken her out of track, gym, and weight lifting. Grateful that the cartilage was not involved as that would have meant surgery. Instead she is going to Physical Therapy. Again, I just don't care for high school sports, too many injuries. Trent has recovered well, ah the rebound capacity of youth, but somehow I imagine that hip will never be as strong as before. Spent 420 day with the kids, went out to lunch and did a little shopping. The guy with the skid loader finally made it out and pushed all the trees that were cut when Erin's house was built into a nice pile for a bonfire this week. Had thought we might burn it last night, but too dry. The sun keeps trying to cut through the clouds, but hard to say if he will succeed. Certainly do hope so as it is always more inviting out there when it is sunny. Plans are for the husband and Trent to move some larger limbs over to the bonfire site. I finished reading "The Paris Wife." Knowing that it was going to end badly for Hadley made the whole thing anti-climactic. Can't decide whether or not I will complete the actual bio. Considered reading "The Sun Also Rises" as knowing the background and the characters should provide more depth. Or, I may just go back to my standard fare of British mysteries. Have the latest of Elizabeth George's Inspector Lynley series, but the book is huge and heavy which is off putting, how pathetic is that? I'm going to go look for something fun to eat and maybe hang up all the clothes I've thrown on the chair in my bedroom.